These instruments are known as“Escopetarras”, a fusion of gun and guitar, created by Cesar Lopez. 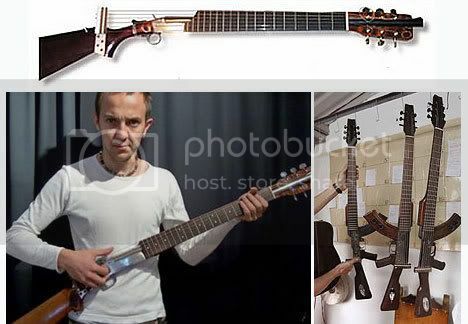 Lopez got the inspiration for the invention while standing outside a bombed Bogotá club and noticing the similarities between his guitar and a soldier’s rifle (whaaa?). Partnering up with musical instrument craftsman, Luis Alberto Paredes, he has been creating the instruments ever since. Initially made out of Winchester rifles, they are now made mostly from everyone’s favorite Cold War assault rifle, the AK47. I don’t really see any use for these, and the acoustics can’t work too well because of the body and shape of the guitar, but, I don’t think anyone purchasing a fusion gun and guitar are going to sit around sing Goom-By-Ya.